Anyone who is truly a lover of movies has to give some love to Roger Corman. The man was never responsible for anything resembling art, but he did manage to accidentally churn out a few films which could be considered underground classics. Unlike fellow schlockmeisters of the era, namely William Castle and Samuel Z. Arkoff, Roger Corman never aspired to be anything more than he was…a purveyor of cheap, fun, low-brow entertainment. But what’s ultimately amazing about Corman is the lengthy list of other actors, writers and directors whom he gave their first shots in the movie business. It reads like a who’s-who of Hollywood big shots: Jack Nicholson, James Cameron, Francis Ford Coppola, Jonathan Demme, Martin Scorcese, Peter Bogdonovich, Robert DeNiro, John Sayles, Ron Howard, Pam Grier, Joe Dante, Bruce Dern…the list goes on and on, and a good number of them are featured in this loving tribute to the man who allowed them to eventually become household names. 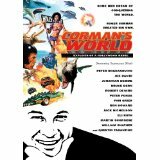 “Corman’s World” is a fast-paced documentary which concisely chronicles Corman’s nearly 50 year career in a mere 90 minutes, featuring dozens interviews and film clips which offer no apologies for what some cinema snobs might deem a dubious career. Corman himself is also interviewed, and shown overseeing his latest production, “Dinoshark,” for the SyFy Channel. Whether one likes Corman’s brand of cinema schlock, after seeing this fun and informative retrospective, you can’t help being somewhat in awe of what the man has accomplished.